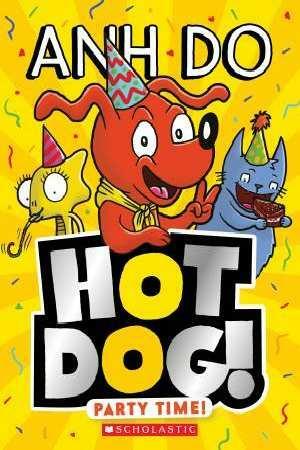 Book Week is fast approaching and I have also started already going to schools getting in early. On Monday the 31st I went down to Woodville Gardens Primary. This is actually the local school of my area so it only took me 2 minutes to drive there. Once there, the kids and teachers were great! It’s awesome to know that I have such a good school so close to my house. First we have HAMMY the pig. Hammy has a burger for a body, T-rex arm and human legs. He lives in a giant TV on Mars. Next we have BOB. 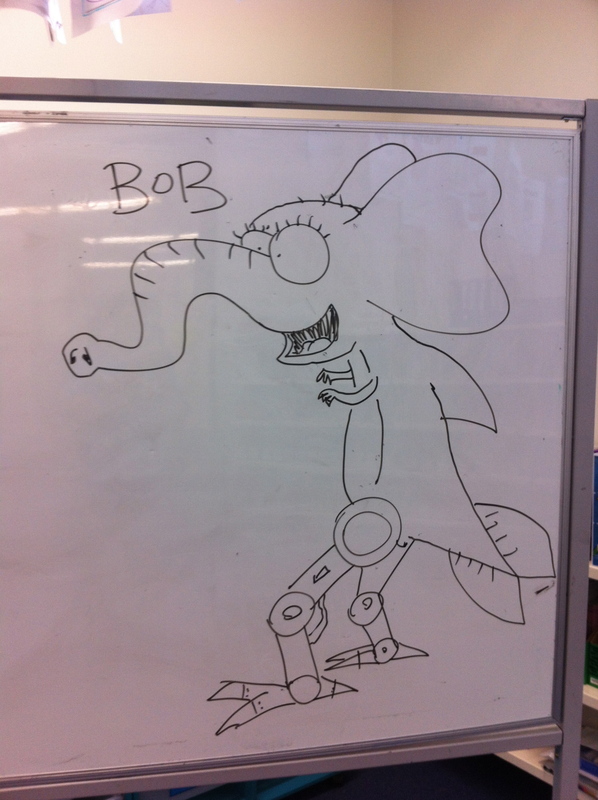 Bob is an elephant that has a chicken for a body, crayfish arms and robot legs. 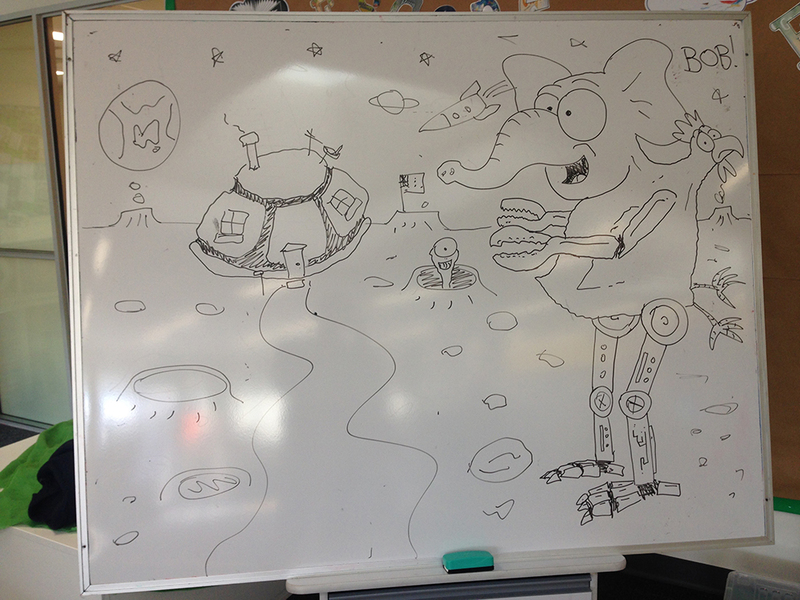 He lives in a giant turtle shell on the moon. 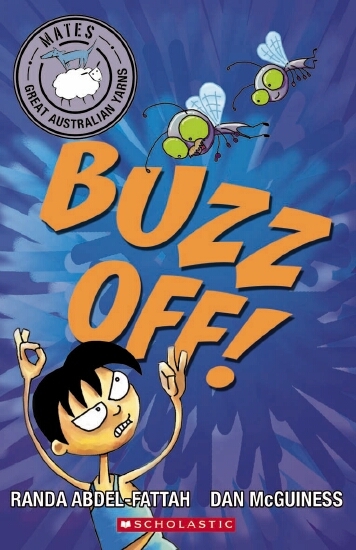 Book week is over for another year. St Michael’s Collage for 2 days. Trinity Collage for 2 days. 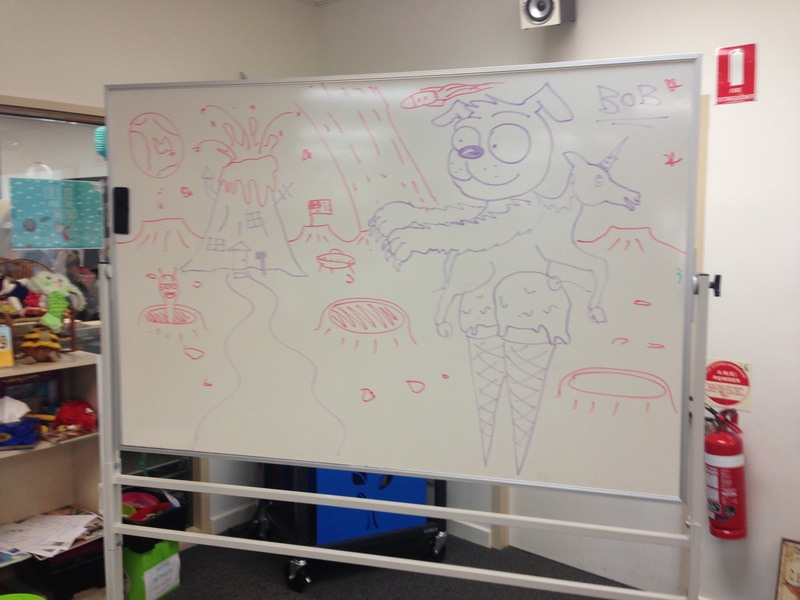 This year at some of the schools I trialed a drawing workshop where I would go through character creation and world building with the kids and then they would draw there own. It worked out great and I’m going to add it as an option for other schools from now on. 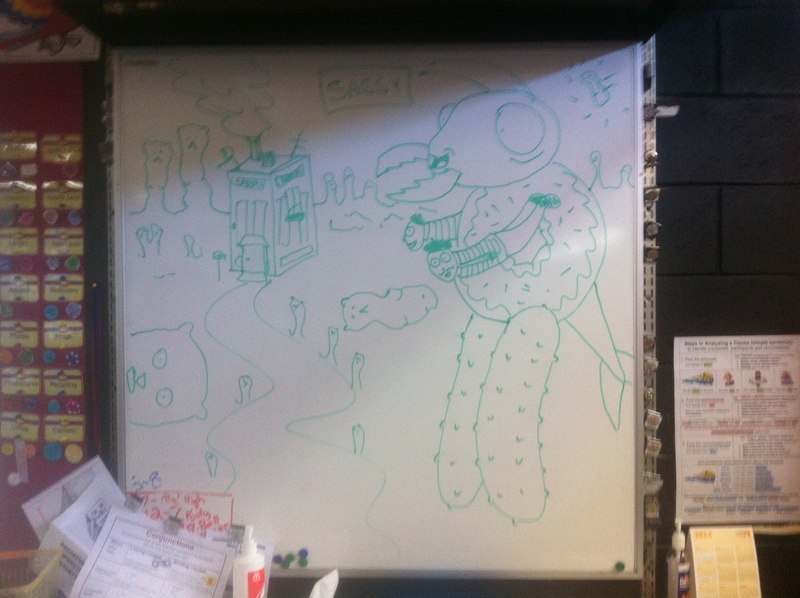 Here are what the kids came up with in the character creation part of my normal talks. 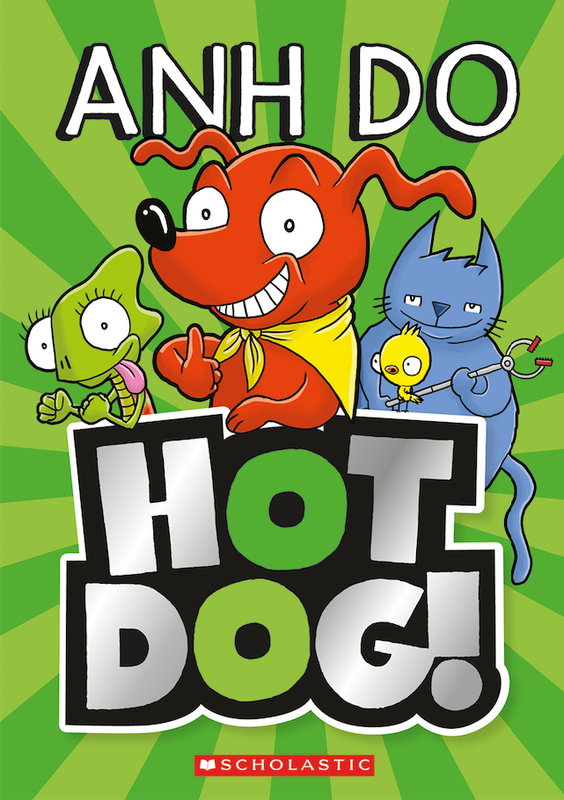 August 26, 2015 | Categories: Drawings, Home, Uncategorized | Tags: 2015, author, book week, childrens author, dan mcguines author, dan mcguiness, kings baptist grammar, talks | Enter your password to view comments. I got to do a bunch of talks at St. Michael’s Primary Campus. As usual I did my character creation bit at the end of my talks. 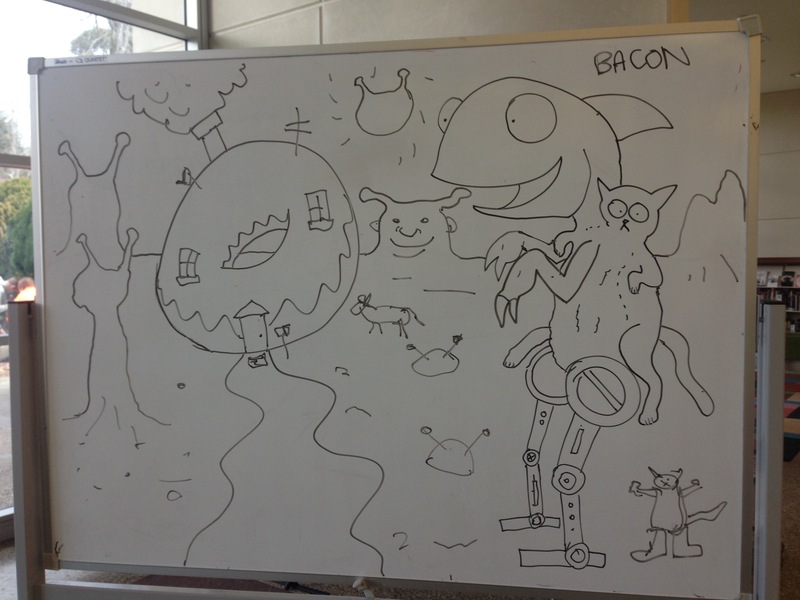 Here is what the kids came up with. 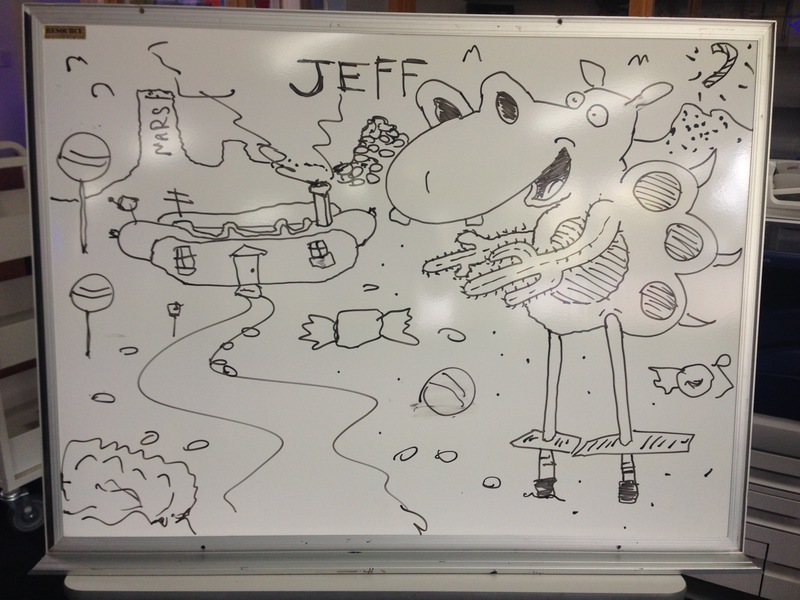 First we have Jeff the Hippo. He has cactus for arms, pogo stick legs and a cats paw for a body. He lives in a giant hotdog in the land of lollies. 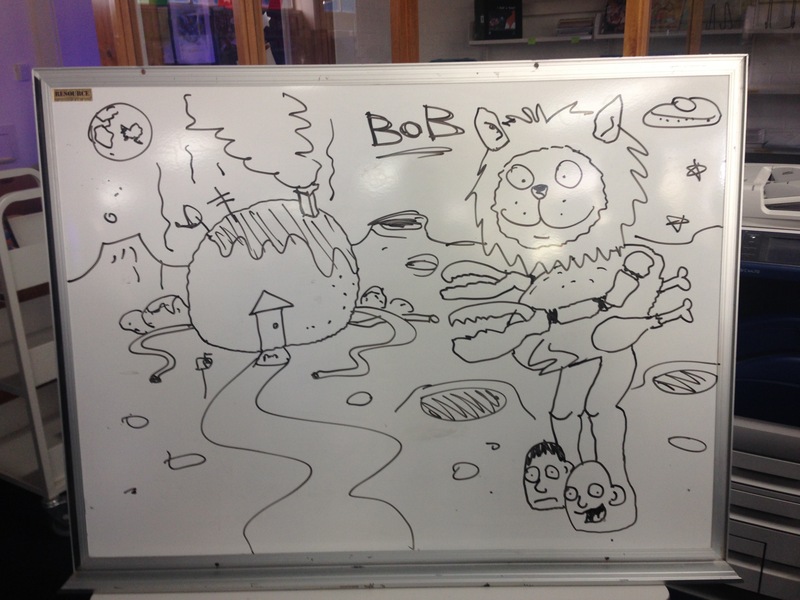 Next we have Bob the lion. He has crab arms, human legs with heads for feet and a roast chicken body. He lives in a giant meatball on the moon. 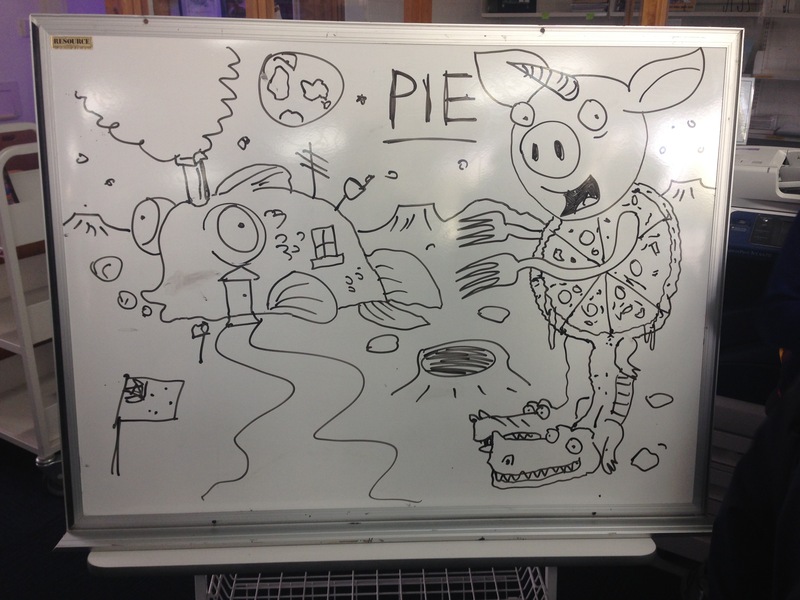 Here we have Pie the pig. He has forks for arms, crocodiles for legs and a pizza for a body. He lives in a giant googly eyed fish also on the moon. Last but not least we have Jeff the chihuahua. 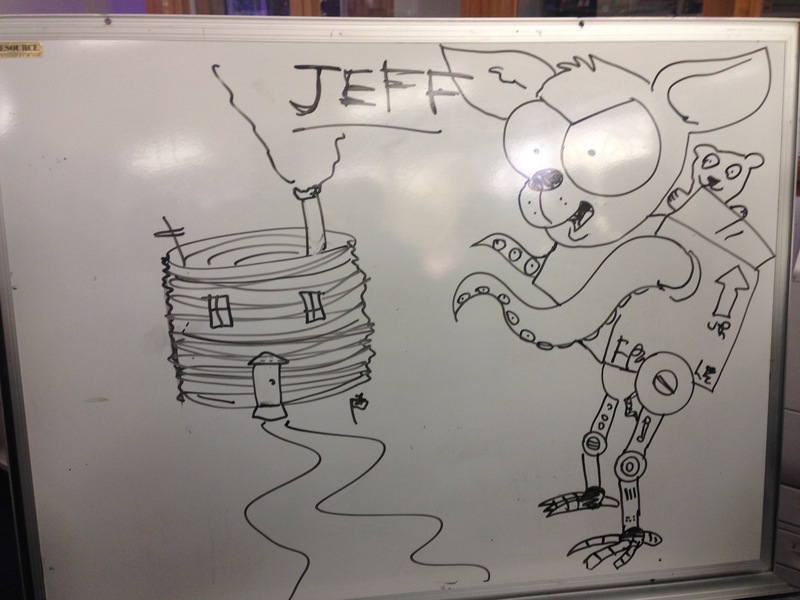 He has tentacles for arms, robot legs and a cardboard box for a body. Jeff lives in a giant slinky. I run out of time to draw what world he lives in but I would like to think that he lives in the world of marshmallows. It was a great day at St. Michael’s Primary School. Everyone was really friendly and the timing of the talks worked really well. All the kids were into it and I had an awesome time. 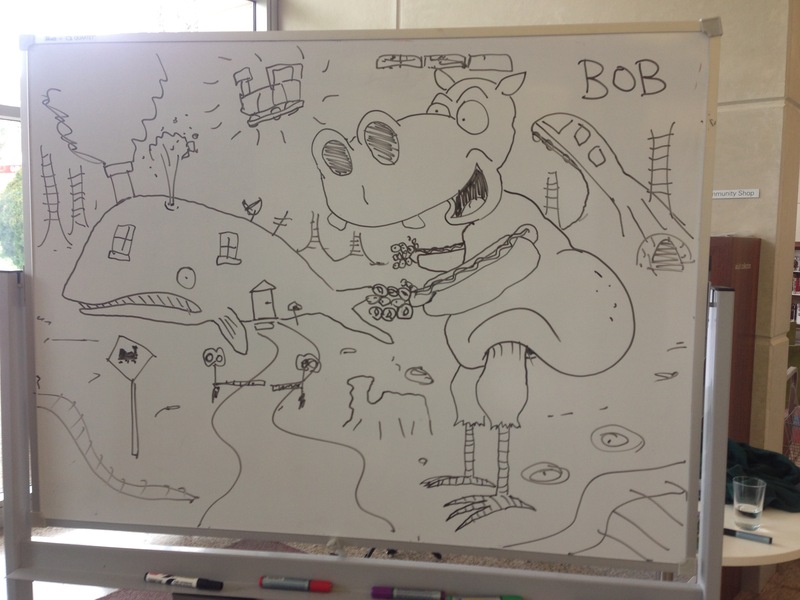 Today I was up at the Stirling library for Book Week. 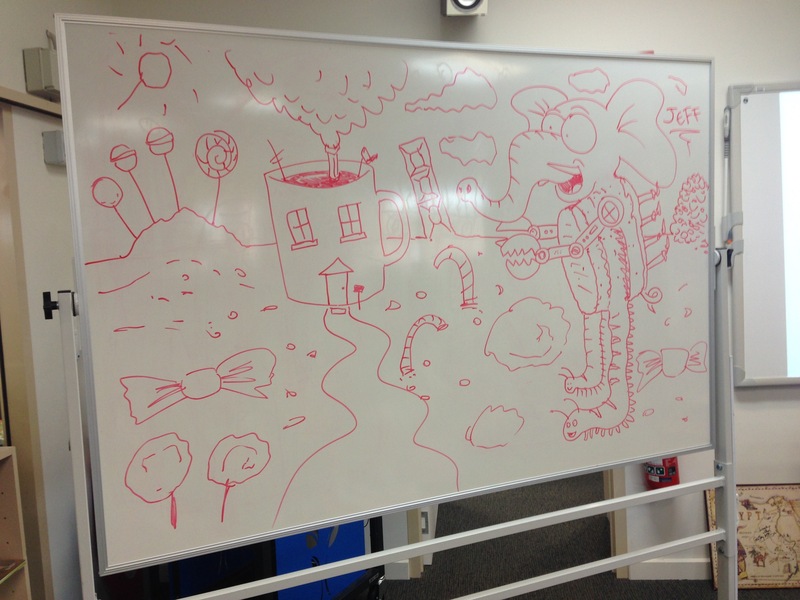 Here is what the kids came up with during the character creation part of my talks. 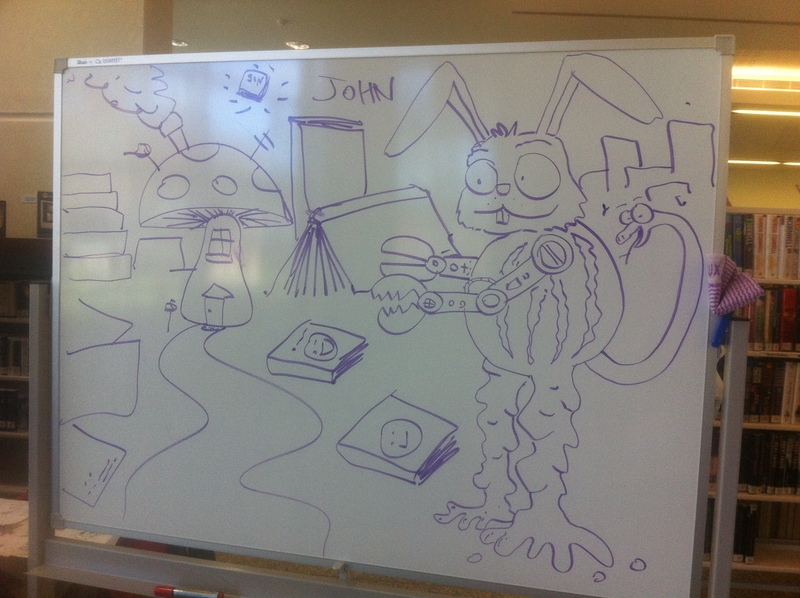 First up we have John the rabbit. He has a watermelon body, custard legs, robot arms and a snake for a tail. He lives in a giant mushroom in the land of books. 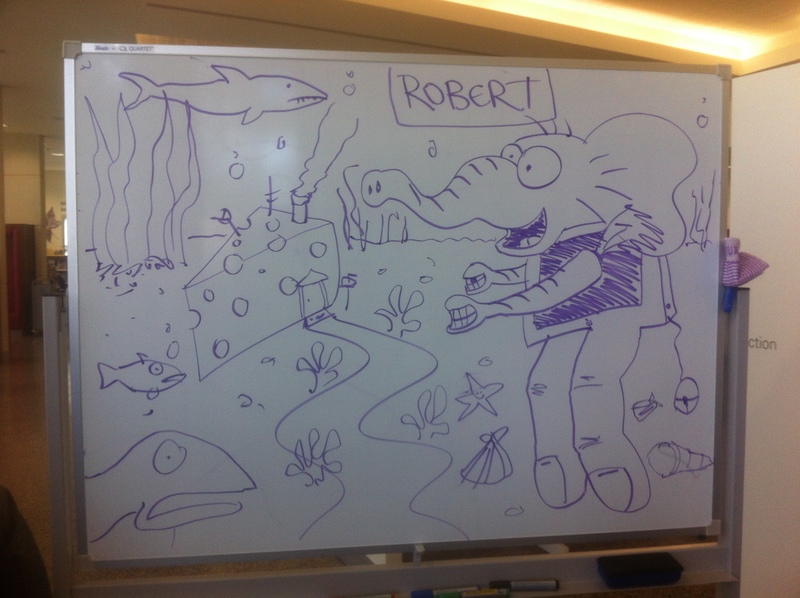 Here www have Robert the elephant. He has a computer for a body, giant fingers for legs and carrots with mouths at the end of them for arms. He lives in house made out of cheese at the bottom of the ocean. It was a great bunch of talks and the teachers, organisers and kids were all awesome! Thanks guys. 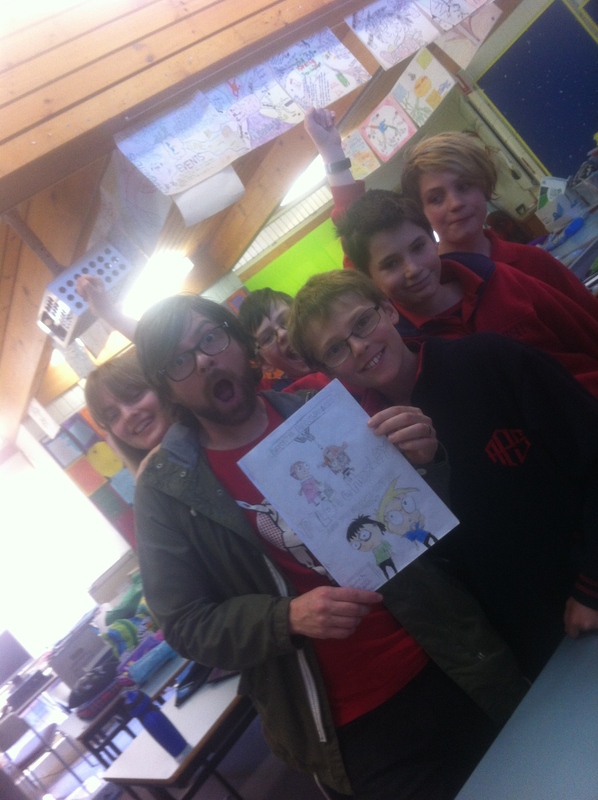 Today I did some talks at Norwood Primary School. 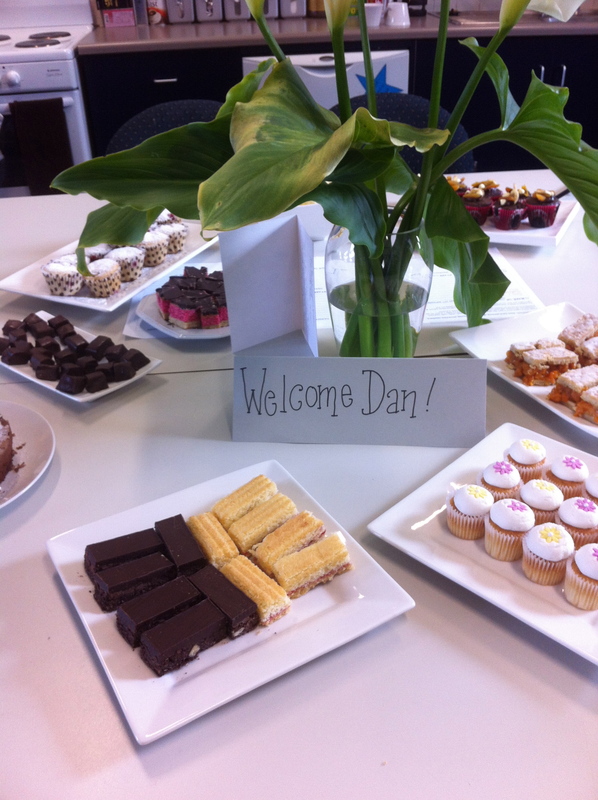 The staff put on an awesome morning tea and I got to speak at there morning assembly. 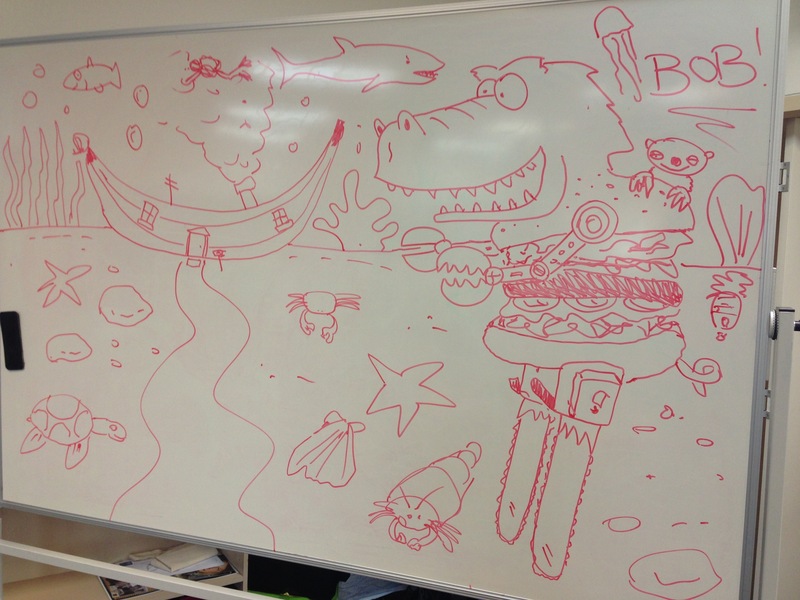 As usual the classes and I did some drawings at the end of my talks. Here is what the kids came up with. 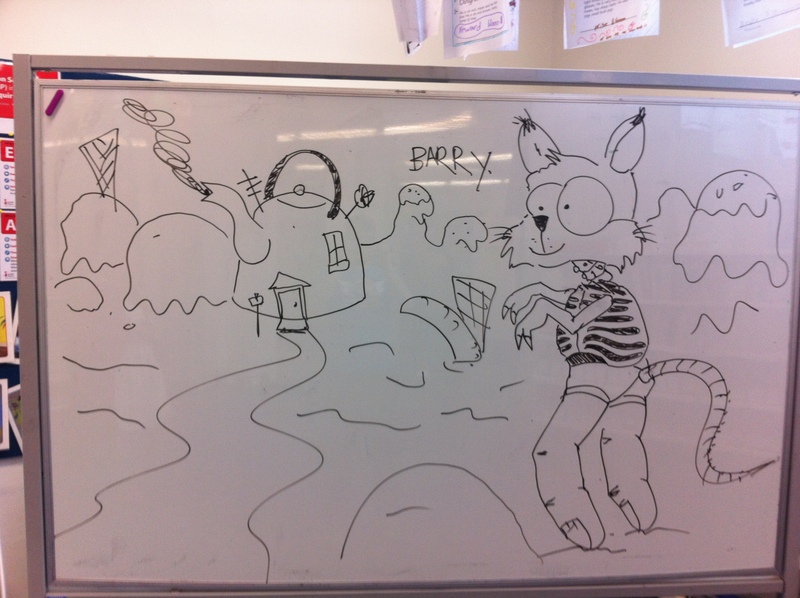 First up we have Barry. 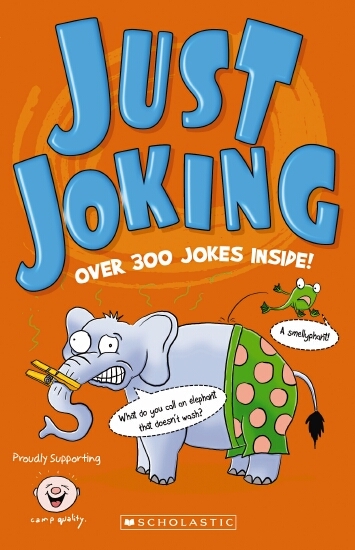 He has finger legs, T-Rex arms, a skeleton’s body and a rodent’s tail. He lives in a kettle in Ice Cream Land. Next we have Bob the female elephant. she has rat’s arms, robot legs and a fish’s body. Unfortunately I ran out of time in this session and I didn’t get to give her a house. 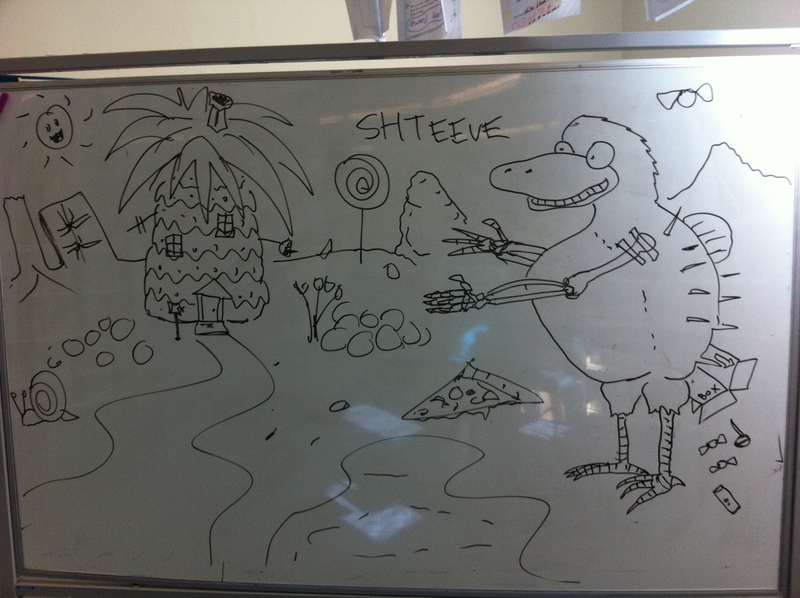 Last but not least we have Shteeve. 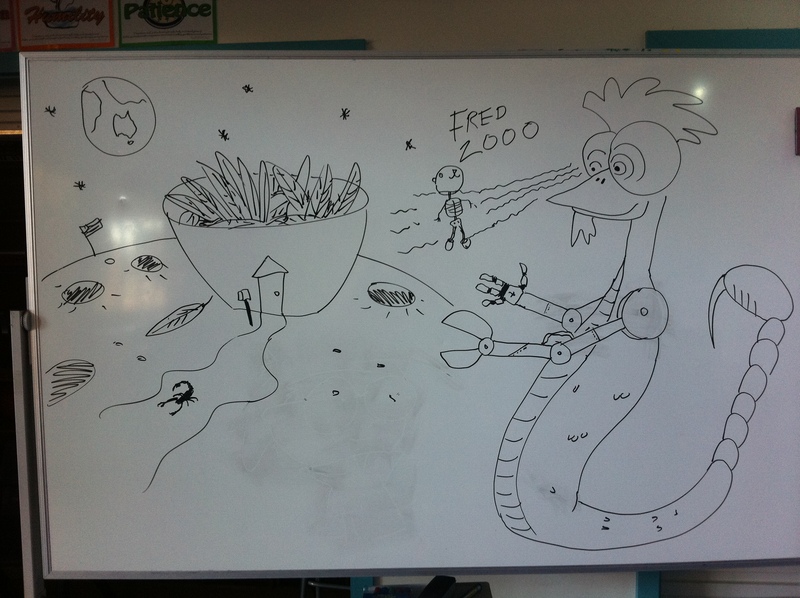 He is a platypus with chicken legs, skeleton arms, a puffer fish’s body and a cardboard box for a tail. He live in a pineapple in Lolly Land. A big thank you to all the teachers and kids for making me feel welcome. 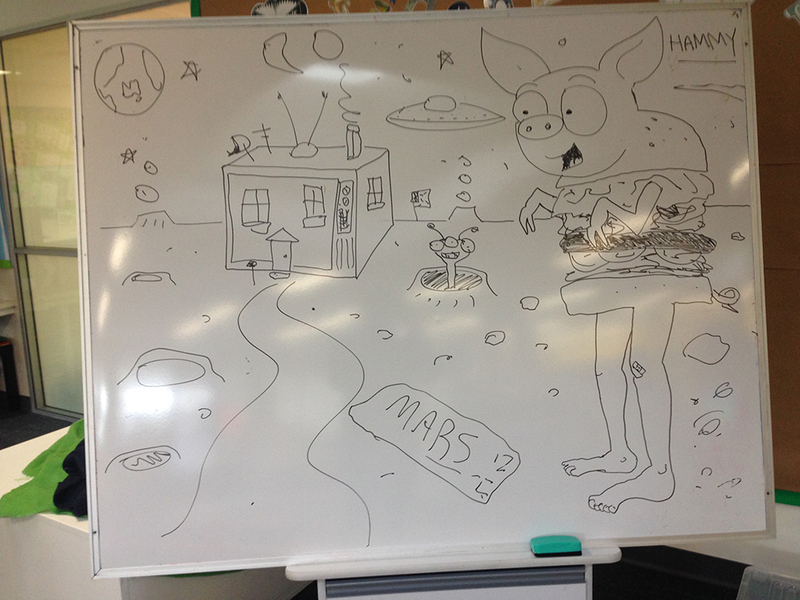 King’s Baptist Grammar Visit – Book Week. 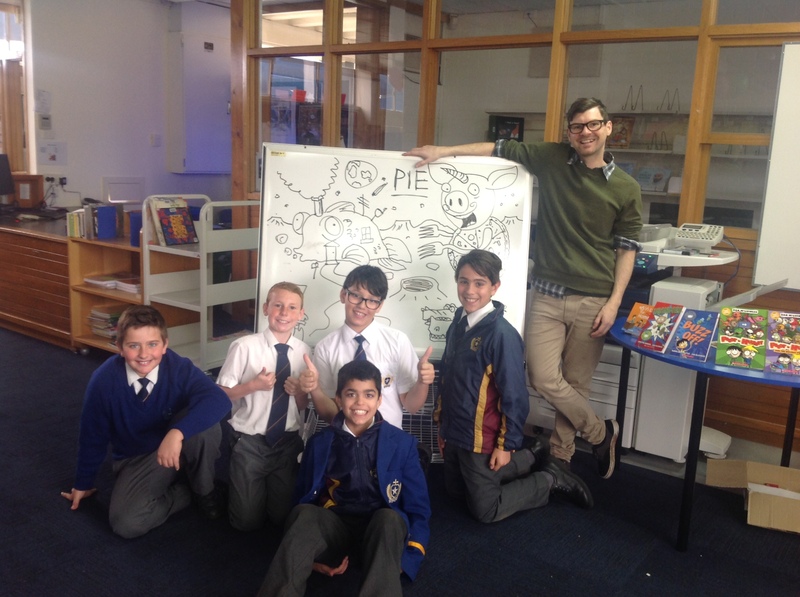 Today I went to King’s Baptist Grammar to do some talks on graphic novels and Pilot and Huxley. 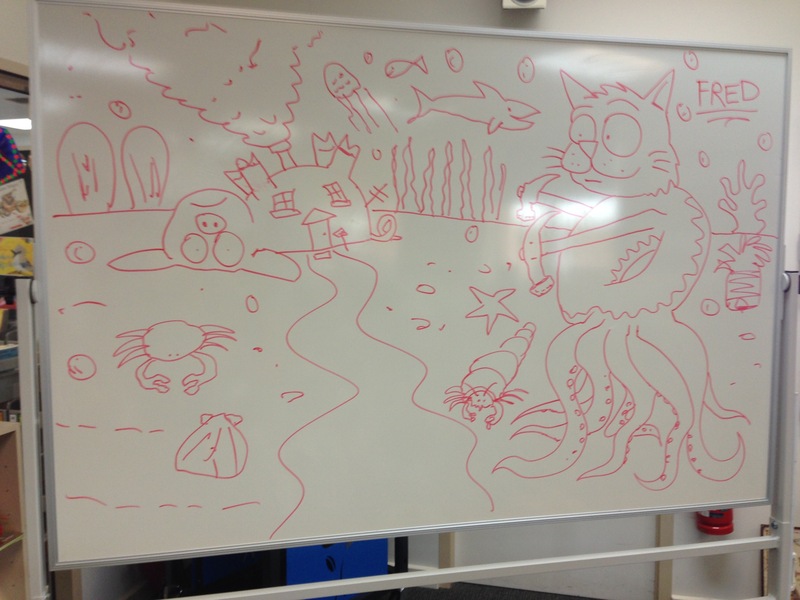 Here are the drawings that me and the kids came up with. Here we have Fred 2000. He is a Chicken that has a snakes body and a scorpions tail. His eyes have x-ray vision. He lives in a giant bowl of feathers on the moon. 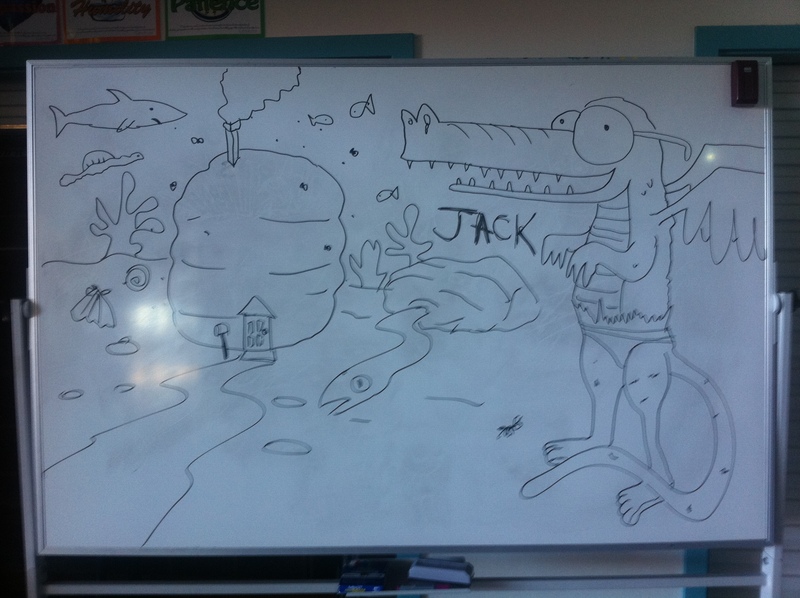 Next we have Jack the alligator. He has monkey legs and dragon wings. He lives in a beehive at the bottom of the ocean. 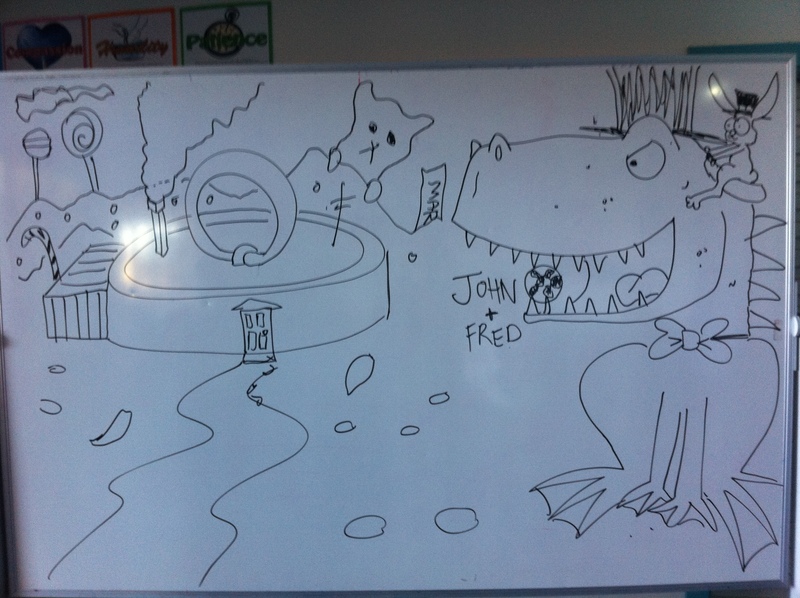 Last we have John the T-rex who has a frogs body. Fred is being ridden by Fred the rabbit. Both of them are going out to posh dinner. They both live in a giant bath plug in lolly land. 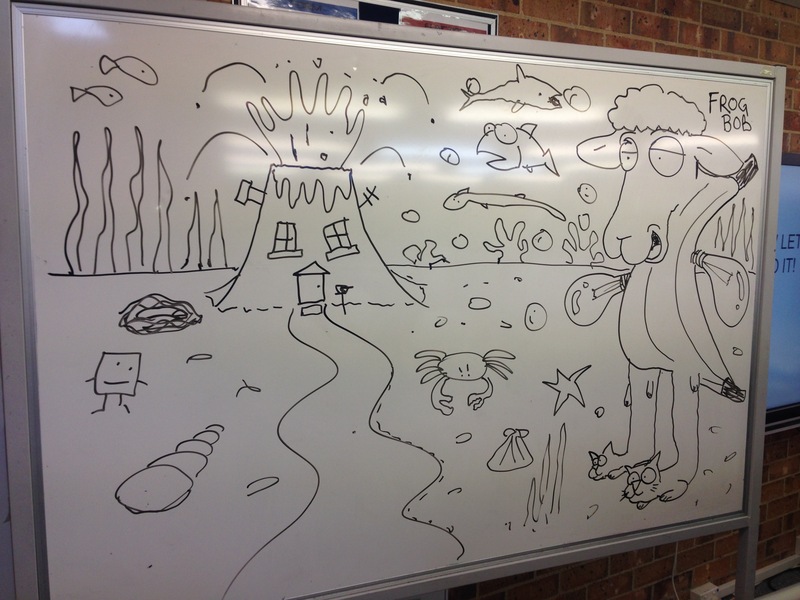 Thanks to all the kids at King’s Baptist Grammar for making my day so fun!!! 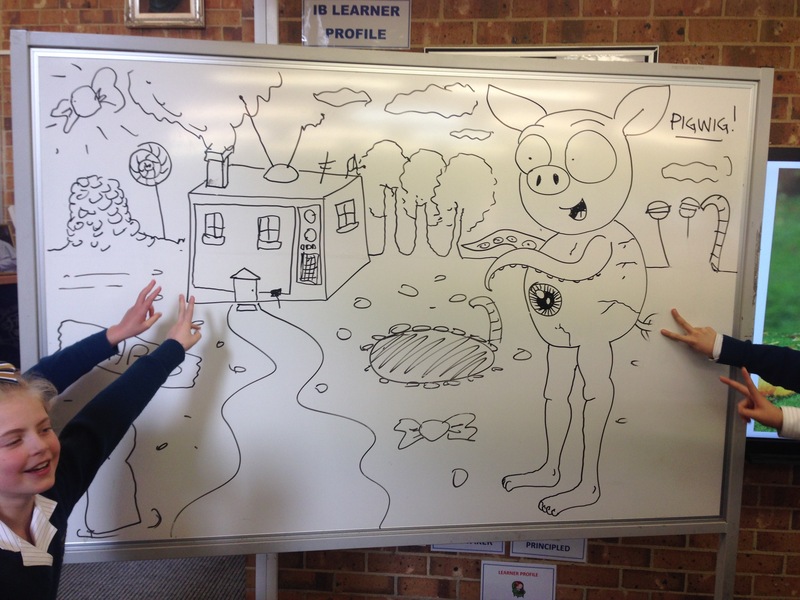 Woodville Primary visit – Book Week. Today I went to Woodville Primary to do some talks. 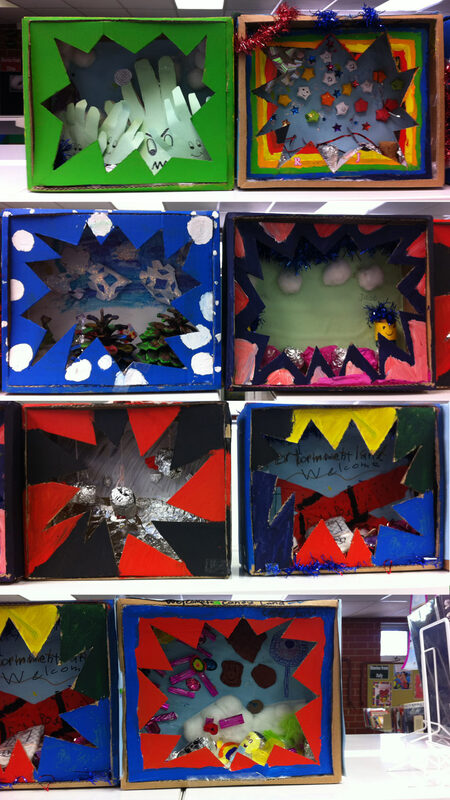 Each class had made me all sorts of awesome things! Here we have some figures from Pilot and Huxley. 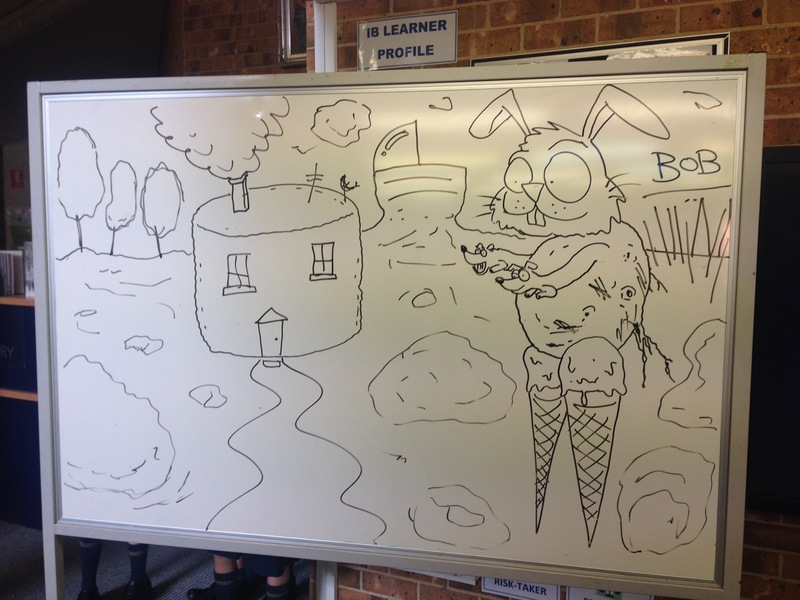 One of the classes remembered that in one of my books I wrote that I scribble comics into anything, even lolly wrappers. 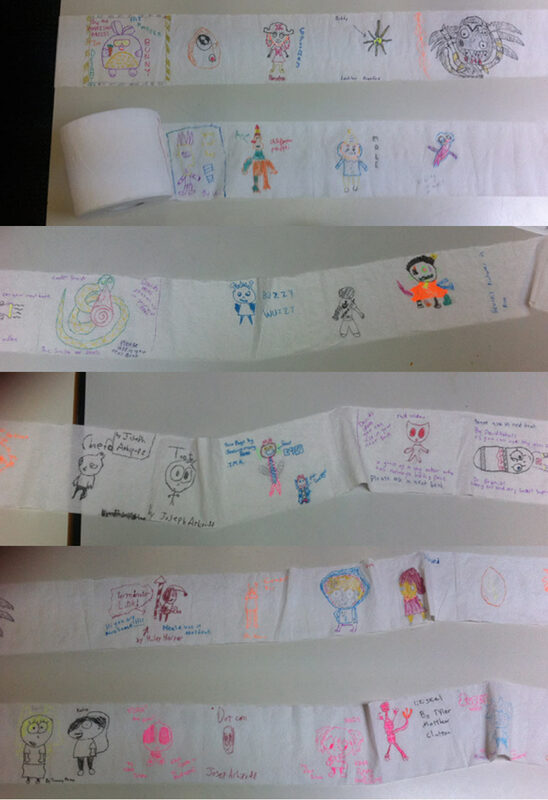 So they drew a whole bunch of characters on a toilet paper roll for me. Another class made portals to other worlds. Then we all got together and created some characters. 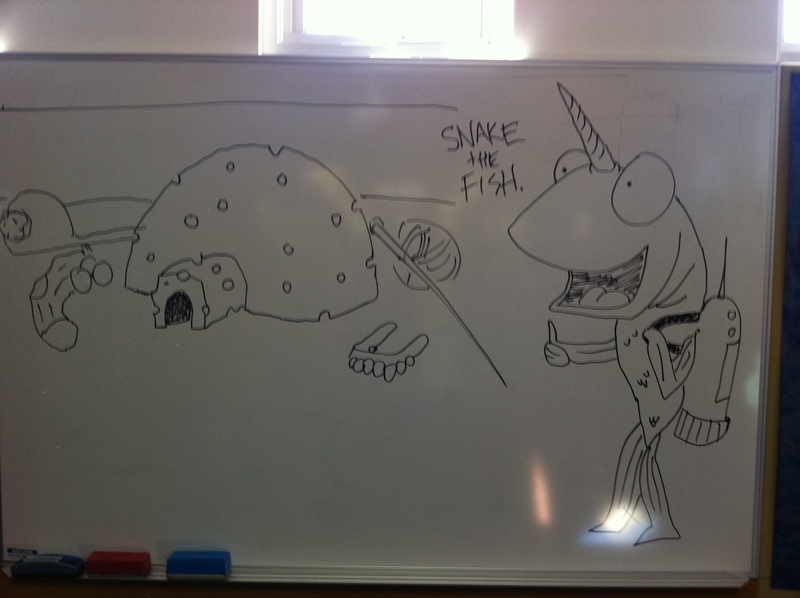 Here we have Snake the unicorn fish that wears a jetpack. He lives in an igloo made of cheese in an old ladies suitcase. 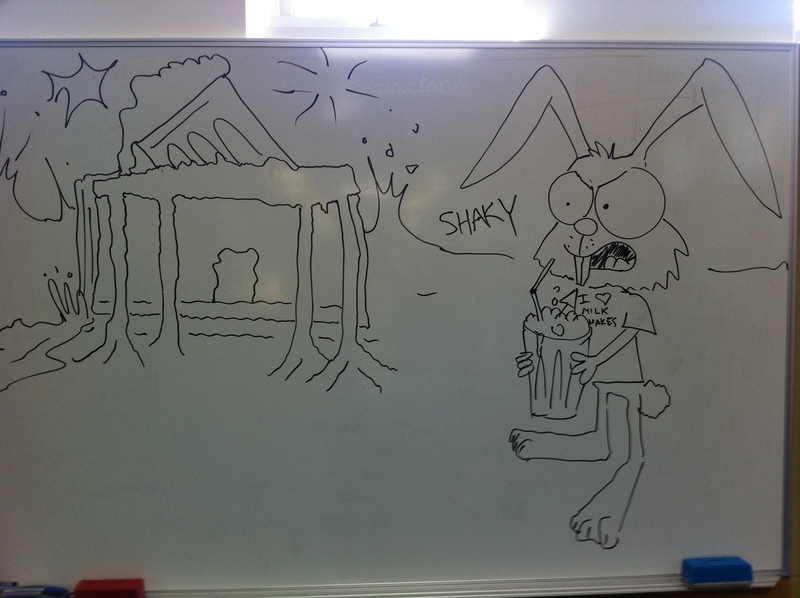 Next we have Shaky the rabbit that loves milkshakes. He lives in a milkshake marshmallow mason hotel that resides in the world of Boom. 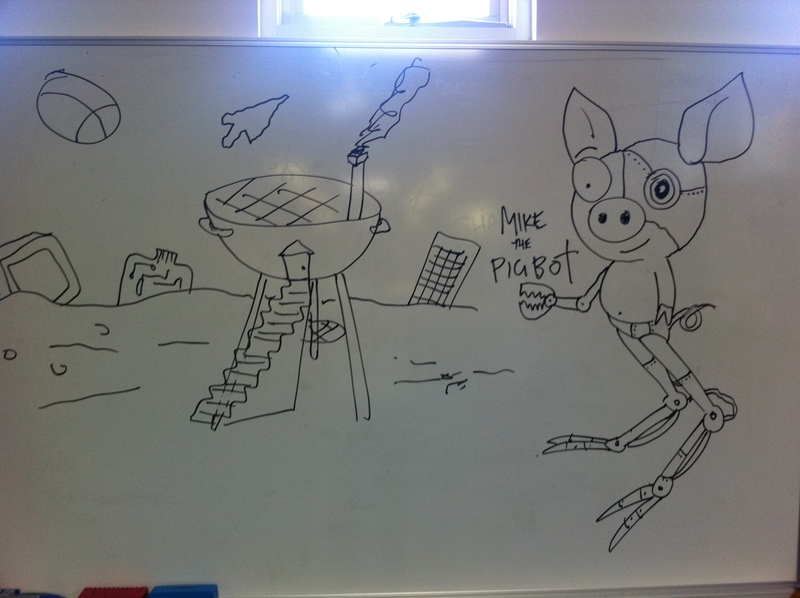 Next we have Mike the Pigbot. He lives in a BBQ in the world of cyberspace / computers. 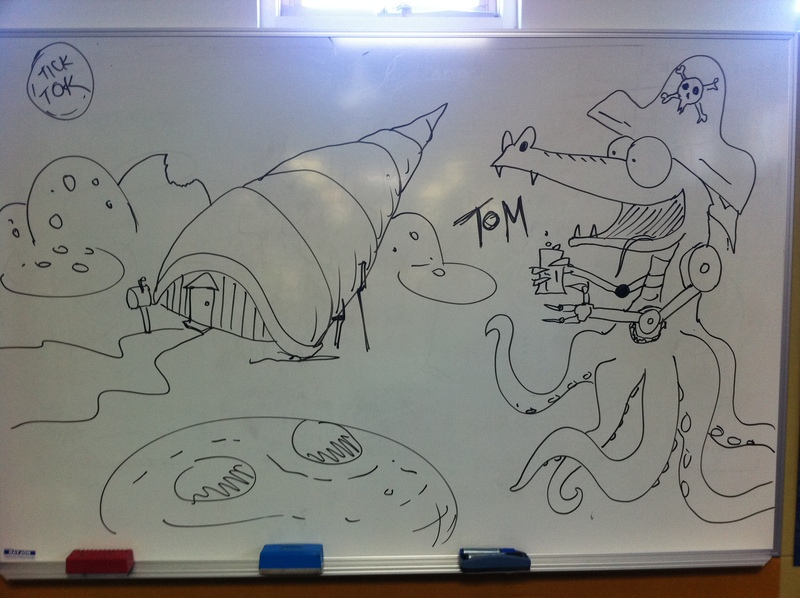 And last we have Tom the pirate dragon that has octopus legs and robot arms. He lives in an old hermit crab shell in the land of cookies. 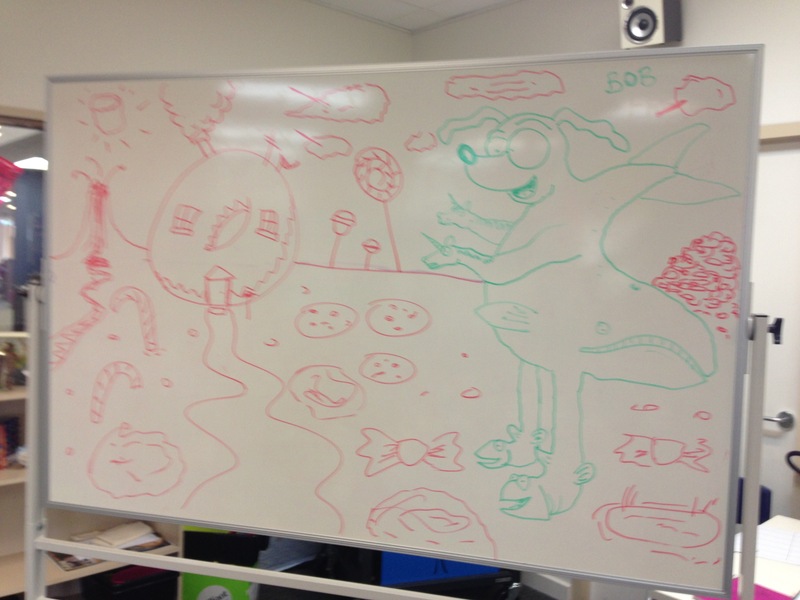 There was also another class that made some amazing circle comics but they left before I got to take pictures of them. I would like to thank all the kids and teachers for such a rad day.